are die cut, so there is no background, just letters or graphics. All stickers come premasked to ensure proper spacing. Promote your shop or site! 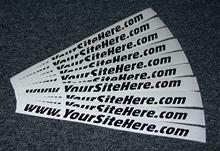 Tell the world about your shop or site with these mini banners. Great for giveaways or include one with every purchase of your product. Great cheap advertising. Everyone loves stickers. sold in packs of 10 only. on your windshield or back window. Made of high quality outdoor sign vinyl so it will last for many years. Promote your shop or product! Tell the world about your shop or product. Great for giveaways or include one with every purchase of your product. Great cheap advertising. Everyone loves stickers. sold in packs of 10 only. We can design you a logo or use one you already have. Just let us know what you need. Tell the world about your business with a Custom Window or Door Sign. Made to your specs. Prices start at: $39.95 ea. Tell the world about your shop or club with a Custom Banner. Made to your specs. & sign vinyl, so it's made to last. Prices start at: $49.95 ea. Most orders are shipped within 48 hours of receiving payment. Prices do not include installation. The Coolest Web Hosting on the planet!!!! Note: The product and company logos on this site are the registered trademarks of their respective companies, and are provided as a convenience only for their lawful use. Any unauthorized use of the aforementioned items by the purchaser shall be the sole responsibility of the purchaser. Any product purchased from GraveyardGraphics.com is not an authorization for the use of any logo or trademark. By purchasing an item from GraveyardGraphics.com you convey that you have the authority (if need be) to legally use the above artwork. All entries become property of GraveyardGraphics.com. By sending us any pics or small videos and entering the contest, you give us the right to use them in any way we like (including but not limited to, advertising, promotion, etc...).